Few experiences are as pleasant as reading to a child. It was a favorite activity when the grandchildren were young. One of them climbed into my lap, I opened the book, and memories were made. They each one had their favorites. Cinderella and Good Night Moon were among them. I especially like board books for little people. They can touch and handle and no one need worry that pages will tear or a book will be ruined by small hands. 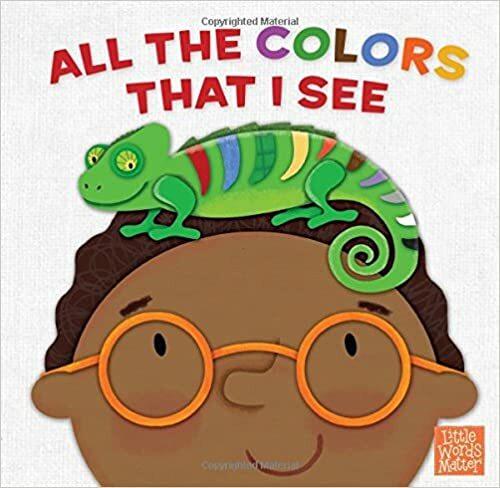 All the Colors That I See, by Pamela Kennedy, is a delightful board book in a just-right small size for little fingers. It offers a bright and attractive beginning reading experience. As the title implies it is multihued. The left side pages are a single color with the color word written in the middle of the page. On the opposite side are cute illustrations, by Holli Conger, and a verse about the color with an action suggested for the child to pick out, point to, circle or count the particular shade. It’s just a pretty little book with lots of possibilities. I like it and would gladly read it to my four-year-old next door neighbor. In fact, I just might. NOTE: I received a copy of All the Colors That I See provided by B&H Publishing Group, for an honest review. The book was free. The words are my very own. The day is full of color, the color of summer. Blue sky, white clouds, green trees, rainbow flowers. July is beauty in so many ways. A friend commented on her garden, her a new farm girl this year with a barn and animals and vegetables to tend. The season for growing is good, “everyday more and more” she said. The earth teaches us God’s law of sowing and reaping. One seed produces many more seeds. Small efforts bring forth a larger harvest. Be careful what you sow, for you shall reap much more. The earth shows the handiwork of God. Creation shouts His glory. The trees clap their hands, and the birds sign His praises. An old hymn, by John Rutter, from a favored book rings this melody . . . The gracious hand of our God spreads a table of goodness for us, for all good things spring forth from Him. He invites us to come, partake, be filled with Himself. Lord of all, to thee we raise this our hymn of grateful praise. I walk into morning light, a light mist hovering over the lake and grassy lawn. Beauty awakens me. I am greeted by sun’s warmth, bird’s song, flower’s bud, and the coffee in my cup that is creamy and hot. I am looking for lovely, finding it at every turn. Like the Psalmist, I long for this thing, to dwell in the house of the LORD all the days of my life, gazing on the beauty of the Lord and seeking Him in His temple. He has given earth’s beauty to be enjoyed, to bring pleasure to the heart. The mountains, the sea, the grandeur of forests and fields, my own back yard. He is beautiful beyond description. And He has made all things beautiful in its time. Every creature, great and strong, small and imperceptible, reveals the beautiful Creator who designed it, spoke it into existence, formed it in perfection. Every life carries beauty within it, upon it. The world has rejected it, stamping its own standard of perceived perfection. And we have missed the artistry and grace of the creation. Look for the lovely in each face today. See the exquisiteness and comeliness of every fair expression. Lift up the downcast heart and speak words of life.